Kirk Morris would play Maciste no less than six times in a brawny film career that included The Witch’s Curse and Atlas Against the Czar. If his clean-shaven pouty look makes you think you’re going to get a brooding muscle god more intent on lamenting his own awesome strength instead of using it, Colossus and the Headhunters leaves no doubt that this Maciste is all about pushing, pulling, heaving, straining, and most importantly of all, killing Headhunters! Director Guido Malatesta (Goliath Against the Giants) knows that in order for adrenaline-addicted modern audiences to have even the slightest interest in the ancient world, that the ancient world must be blowing up right from the get go! And it does! Again and again, we see the same shot of a fake volcano exploding while shots of cavemen getting pummeled by falling foam rocks are expertly edited in between! 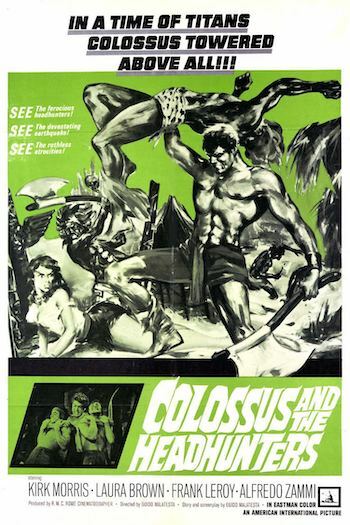 Colossus and the Headhunters is such a burly and bruising mix of non-stop nonsensical mayhem that these cavemen aren’t even the titular Headhunters! But surely then, these fur-clad simpletons must be the tribe that Maciste cruises in to assist as their world literally falls apart around them and even swallows them up whole! Nope! There’s a separate, more advanced tribe that is also caught up in the destruction that Maciste bails out! So what were those cavemen doing there and what they did they have to do with anything? Beats me, but I love watching panic-stricken natives abused by Mother Nature’s capricious ways, so who cares! Maciste helps the survivors aboard a raft and sets sail away from the exploding island. He’s not sure where they are going until someone reminds him of the fabled land to the west where there are cities of gold. There’s no food or water on the raft, so it’s quite lucky that this faraway and forgotten land of legend turns out to be about 3 hours away by boat! But as is the so often the case with fabled cities of untold riches, all that is found is just some other crappy tribe living in the woods! And living in fear of the local Headhunter population! One of their own (Kermes) turned traitor and teamed up with the Headhunters, who destroyed their city and drove the tribe into the wilderness. Kermes is motivated by a desire to rule the tribe, but his ambitions seemed to run far ahead of his brains since his plan involved having the great city destroyed and the surviving tribesmen reduced to dirty nomads. No matter because he has an ace up his sleeve! The king is imprisoned in the old city and he uses him as a way to force the king’s daughter Amoa into marrying him so that everyone will have to recognize him as king! All goes according to plan for about five seconds until the tribesmen still on the loose meet up with another set of tribesmen who just happen to be wandering around the same part of the forest all decked out in battle gear and just waiting to help invade the Headhunters’ camp. Maciste again demonstrates his prowess for just sort of making things up as he goes along and somehow having it work out like he did on the raft as he goes off to the ruined city in search of the king despite everyone saying the king is surely dead. The level of violence Colossus and the Headhunters sustains during its very brisk 77 minute running time is quite impressive. Guys get shot in the neck and the eye with arrows and Maciste even takes one in the chest, but pretty much shakes it off without too much problem. While the Headhunters only chop one guy’s head off, you do get to see a couple of heads on poles in the village. They also do their fighting with axes which makes for some nice axe against sword action. For his part, Maciste is the perfect blend of apathetic aggression and gaudy strength the best sword and sandal icons have. He strangles guys with chains, collapses bridges, throws off gangs of attackers, flips two guys at once, and even topples a large wooden observation post off a cliff onto an already burning hut! Toss in a very effective musical score and a silly dance scene that resembles a slow motion seizure and you have a Colossus-sized winner!